Quick tutorial for beginners how to install μTorrent (uTorrent) in Ubuntu 16.04, by setting up μTorrent server in Ubuntu so you can easily access and control your BitTorrent downloading any where (over LAN or internet) using a web browser. Open a web browser and go to http://server-ip-address:8080/gui or http://yourdomain.com:8080 to get into the login screen. (get you ip via ifconfig command). For the first login, type admin as username and leave the password box empty. Once you’re in, go to Settings -> Web UI to change username and password, remote access IPs. And you may enable Remote Access to allow remote access from anywhere on the internet. or just use qbittorrent, which is a FOSS alernative to uT and whose devs have never injected Litecoin mining into the code. You can simply use Transmission BitTorrent Client instead. utserver in ( utserver – settingspath… etc. ). Do you have an idea as to what am I doing wrong?. I am a beginner who has just started with Ubuntu. I’m running the Ubuntu 16.04 desktop and these are the exact settings I used and it worked. Hi! I followed these instructions and when I ran the command to start the uTorrent server, the error ‘no such file or directory’ was displayed. How do I solve this? Also, how do I create a shortcut to desktop? Hi, I followed the tuto,and everything went without problems,but any time I clicked on a link, the SO only offered me my old Torrent program (Transmission), still installed in my machine. So I decided to remove the program and re-start the machine. 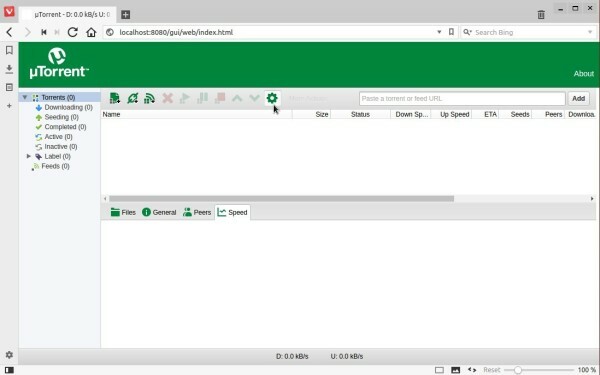 Now I cannot open uTorrent, every time I try to open Firefox says that cannot connect with the server 192.168.1.49:8080..
My machine is running Ubuntu Mate 16.04 and the browser is Firefox, though I also tried Qupzilla with the same results.